All the information in this blog post is subject to change as Exchange Server 2013 is still under construction. Although it’s not very likely that big changes will occur between now an RTM, it might. In addition to some of the existing blogs and information out there, I wanted to take the time and explain the “new” Public Folders in Exchange Server 2013 a bit more in detail. Ever since Exchange Server 2007 was released, Microsoft proclaimed Public Folders would eventually disappear. At that time, it was said Public Folders would stop to exist in “future versions” and consultants were given the advice to evangelize SharePoint as being thé replacement for Public Folders. It seemed, however, that these statements provoked quite some comments from the field: companies world-wide would still be using Public Folders and were not planning on giving that up so easily. Knowing what a migration to SharePoint could potentially cost, it’s quite understandable that some companies were rather reluctant to immediately jump on the SharePoint-train. In fact, I cannot blame them. Even through today, there’s no real solution that offers the same functionality and ease of use as Public Folders. Over time, Microsoft seems to have recognized that killing Public Folders might not be such a great idea after all and changed it’s attitude little at a time. Nevertheless, they’ve always deemphasized using Public Folders. To better understand at what the changes in Exchange Server 2013 are, let’s first have a look at how things were in Exchange Server 2010. In Exchange Server 2010 (and before), Public Folders were stored in their own database(s). Hierarchy which contains the properties of the public folders and also includes the tree-structure in which the Public Folders are organized. This tree structure contains Public- and System Public Folders. It was up to the administrator to define what content would be replicated across one (or more) servers. When a public folder was setup to have multiple copies, a process called “Public Folder replication” ensured that data was replicated across these “replicas” (= other public folder databases). Although from a data point-of-view having multiple writeable copies of Public Folders highly available: it is not. At least not when it comes to the end-user experience during a failover. Each Mailbox database is configured with a default (“preferred”) Public Folder database. Mailboxes within that mailbox database would automatically connect to their preconfigured “preferred” Public Folder database. If – for some reason – the server hosting the Public Folder database would be unavailable entirely (e.g. offline), a timeout (+/- 60 seconds) would occur and clients would be redirected to another Public Folder database. If, however, the server would still be online but the database would e.g. be dismounted, there would be no redirection and clients would end up with no Public Folders. As you can imagine, not really a nice user experience, is it? From a design point of view, Public Folders allowed you to easily spread data across multiple locations and have people make changes to the data in different locations. These changes are then replicated amongst the different replicas. 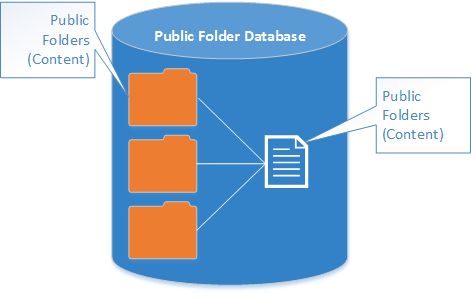 In fact, Public Folders (in Exchange 2010 and before) are implemented in a sort of multi-master model: all public folder replicas in a PF database are writeable. Exchange Server 2013 entirely changes how Public Folders operate (from a technical point-of-view). From an end user’s perspective, everything remains as it used to be. Public folders are now also mailboxes, but their type is “Public Folder” (just like a Room Mailbox is a Mailbox with type “Room”). In a way, Public Folders still exist of two main elements mentioned above: the hierarchy and contents. The hierarchy is represented by what is called the Master Hierarchy Public Folder Mailbox. This PF Mailbox contains a writeable copy of your public folder hierarchy. 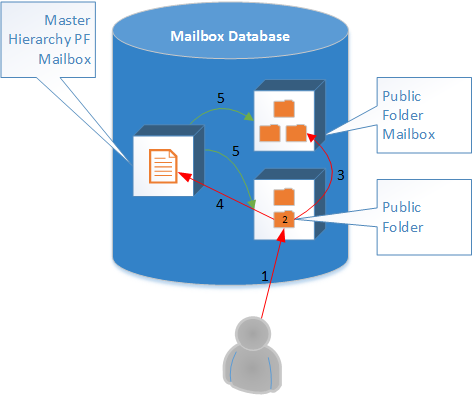 There is only a single Master Hierarchy PF mailbox in the organization. Contents (in Public Folders) are now stored in one or more Public Folder mailboxes. These Public Folder mailboxes usually contain one or more Public Folders. Next to the contents, each PF Mailbox also contains a read-only copy of the hierarchy. Note because Public Folders are now stored in mailboxes, mailbox quota’s apply to them. For instance, this means that if a PF Mailbox would grow too large, you’d have to move Public Folders to another PF Mailbox (or increase the quota). PF Mailboxes can grow quite large without really suffering from performance issues, just like regular mailboxes. Although real-world experience will have to tell us what the performance of Public Folders would be with a large amount of numbers, I’m confident that most companies won’t have a problem fitting a Public Folders in one (or more) PF Mailboxes. Nonetheless, you should carefully plan your Public Folder deployment, especially If you’re company heavily relies on them. How do these “new” Public Folders work? A user connects to a Public Folder (Mailbox). Hierarchy changes (e.g. adding or removing folders) are redirected to the Master Hierarchy PF Mailbox from where they are in turn replicated to all other PF Mailboxes (5). Because Public Folders now reside in regular mailbox databases, they can benefit from the High Availability model that a Database Availability Group offers. Since you can store Public Folder mailboxes in any database, there’s no difference as to how they are treated in case of a failover. Because of these changes, the way we will implement Public Folders will also change. Foremost, placement for Public Folders will require a bit more planning from now on.There can only be a single active copy of a mailbox database at any given time, so we can no longer “benefit” from the multi-master model that existed previously. This means that you should – preferably – place your Public Folder Mailboxes as close to your users as possible. If, however, to different groups need to work on the same set of folders but at opposite sites of the globe; you might be in for a challenge… Of course, one might start to wonder if Public Folders would be the right choice in such a scenario after all. I will keep the migration and coexistence part for a future article. At the moment, Exchange Server 2013 Preview only support greenfield installs… On the other hand, if you’re interested in reading more on the migration stuff, you might want to take a look at a fellow-UC Architect Mahmoud Magdy’s blog about the new Public Folders. Glad to see PF consolidated into Mailbox stores but at the same time concerned about the growth of the mail store, no. of mailboxes to be hosted on each store and size(again improved from 2010 ) too. Would look further for the coming updates as the New Exchange seems to be interesting…! I was bit concerned about the PF content replication…what if there was a requirement to share the same content across state/country users having exchange locally under one org…did you mean replicating the whole DB for PF content which is under mail store? That’s indeed one of the things you need to keep in mind. You can only have a single active copy of a mailbox database (e.g. with PF content) running anywhere in the organization. This means that if you want to share information between geographical locations, you will need to keep in mind where you’ll place the PF content as you will only be able to (actively) have it in one of both locations. Hmn…I see that means active copy at least in each location and replica of the active PF mailbox using DAG replication…! Beware: you can only have a single active copy and not two. This means that your public folder will either be active in one or another location (not at both!). The replication will indeed replicate the PF mailbox to a passive Mailbox database. Ok…so it looks as if there is only HA available for PF mailbox…not content replication as in legacy still the single point of access irrespective of the user where they connect from…anything MS looking towards it – correct me if am wrong. Lets say if there is no DAG or PF isn’t part of the DAG. 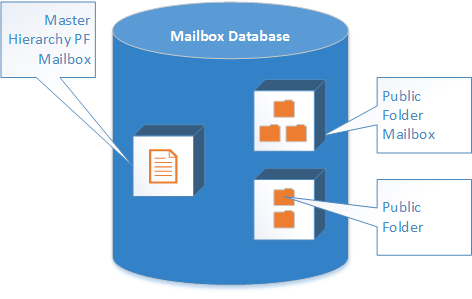 what happen if this single master hierarchy PF mailbox database fails? can we bring other as a hierarchy master? You definitely don’t want to lose the primary hierarchy mailbox. As far as I understood, it will render PFs read-only. I’m not aware of a mechanism to promote another mailbox to the primary nor of an automatic mechanism.